Fun fact: there’s an entire company dedicated to helping game developers create believable trees. SpeedTree offers developers a huge library of trees as well as tools that let them quickly make their own, and its tech has appeared in everything from The Witcher 3 to Forza to Destiny. Which video game trees are the best, though? I went to the SpeedTree booth at GDC to find out. Unless you’re a woodsman-turned-Twitch-streamer or an NPC squirrel, you probably don’t spend a ton of time thinking about video game trees. But Sonia Piasecki, who’s been an artist at SpeedTree for five years, does. Even so, she had to think for a splinter-sized portion of yet another year before reaching a verdict. She also gave props to the setting, Egypt, which allowed for types of trees we don’t often see in other open-world games, focused as they are on verdant fantasy plains and bustling modern cities. “It’s amazing how places like that have so much plant life that you just don’t think about,” she said. 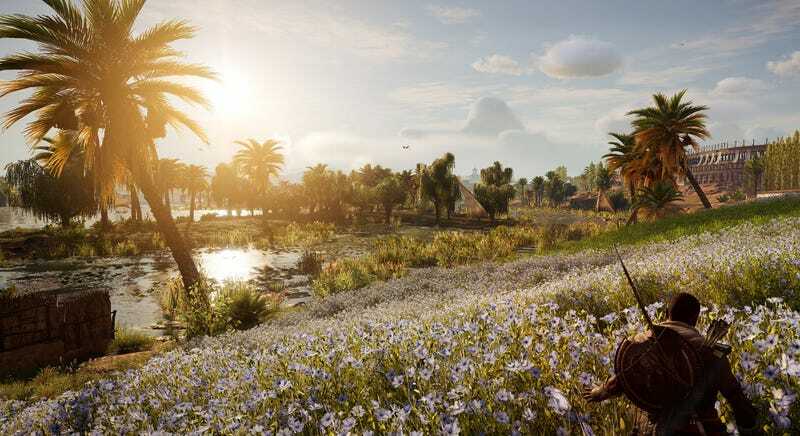 So that settles it: Assassin’s Creed: Origins has the best video game trees. Well, aside from the Great Deku Tree from Legend of Zelda: Ocarina of Time. And The Witcher 3's special glitch commemoration tree. And... well, maybe this isn’t really settled at all.